Ever feel like you’re on a malfunctioning treadmill that’s speeding out of control? You’re constantly running – meeting to meeting, big idea to big idea – but never catching up enough to move your business forward. In our frenetic and complex world, it’s easy to get distracted by peripheral noise and lose focus on execution. But the bottom line is that lack of execution costs you time and money. Time is finite. Choose wisely. It’s a paradox, but you can accomplish more by doing less. First, you’ll need to tweak your mindset and retrain yourself to sift through the madness to get to the essentials. Once you give yourself permission to stop trying to do it all and to stop saying yes to everyone, you can make your highest contribution toward the things that really matter. You can choose how to spend your time and energy. Almost everything is noise. Few things are exceptionally valuable. You can’t have it all, do it all or be all things to all people. The last thing each evening or first thing each morning, set aside a few minutes of quiet time. Ignore your phone and email and close your door. Then write on a post-it note or card the three most important things you will focus on the next day – or that day if it’s morning. Make the items specific, but not trivial. They should be broad enough that you can carry the focus through the entire next day. For example: expand into a new territory, increase profits, improve productivity. Goals are great, but execution is where most people fall apart. You’ll probably find that maintaining your focus through all the noise is a bigger problem than you imagined. Keep your list of goals handy and refer to it throughout the day. Consider other reminders as well, such as periodic phone alarms to remind you to focus. One executive who wanted to hire more military veterans wore a flag pin daily, touching it often to remind him of his goal. Throughout the day, in every meeting and every encounter, address your number one priority. For instance, if you’re considering expanding into a new territory, ask the IT team during your weekly meeting about the resources it would need to accomplish this. If you have lunch with a reporter, ask his opinion about the expansion or what he knows of the area. Once you’ve set up your priorities, drop the superfluous. Anything you can’t tie to the first bullet is likely noise and therefore nonessential. Never blindly accept a meeting; in fact, do everything possible to avoid doing so. Ask what your role in the meeting is, who else will be there and if someone can take notes for you. This forces employees to create agendas and make more independent decisions. As a leader, you must be sure others build out their execution strategies to help accomplish business priorities. In his book, A-ha! Performance: Building and Managing a Self-Motivated Workforce, Doug Walker suggests that if employees can’t answer these three questions with a resounding “yes,” chances are the goal will never come to fruition. Is it attainable and realistic? Is the profit or payoff – either to the person/people involved or to the company – greater than the costs? This may include money or intangible items, such as ego or reputation. In order to find focus, you must escape the cacophony daily. Experiment until you find the best method for you – perhaps meditation, 10 minutes of deep breathing or just a few quiet moments before you get out of bed in the morning. Being alone with your thoughts will give you a bird’s eye view of the big picture and help you find clarity. By choosing wisely and focusing on what’s important, you’ll be able to step off the treadmill and get to work succeeding. Do you want more ideas for building a team that focuses on winning goals? 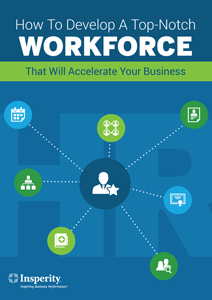 Download our free e-book, How to Develop a Top-notch Workforce That Will Accelerate Your Business. And yet, the problems he faced and the tactics he used aren’t that dissimilar from the challenges corporate quality leaders leverage to keep their teams on track today. When executive leadership decides to implement standards, we often get a directive-based How many new clients?